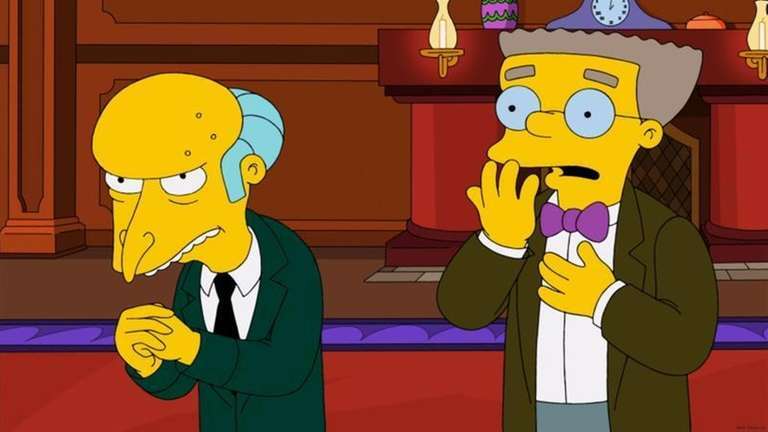 "The Simpsons" showrunner Al Jean, in an interview with Entertainment Weekly held out hope Thursday that the voice of Mr. Burns and so many other beloved characters, Harry Shearer, might return to the show. "Well, we're still hoping he might come back," Jean told Entertainment Weekly. "Nothing's done 'til it's done. . . . There's an offer that the rest of the cast accepted, and Harry has not accepted it. It's not going to change, because the rest of the cast took it. So we're hoping he does. If he doesn't within a certain period of time, we would have to recast -- but we haven't started." Shearer, who also does the voices of Ned Flanders, Principal Skinner and Smithers on the world's most popular animated series, announced via Twitter late Wednesday that he would leave the show over a work-related dispute. Shearer broke his news in a series of three tweets just before midnight. The first reading, "from James L. Brooks' lawyer: 'show will go on, Harry will not be part of it, wish him the best.' "
Fox declined to comment late Thursday, referring to a comment originally tweeted by Jean, later called an official statement by the other showrunners, including Brooks and Matt Groening: "Harry Shearer was offered the same deal the rest of the cast accepted, and passed. The show will go on and we wish him well. Maggie [the Simpson family's baby daughter] took it hard." Jean also added, "We do not plan to kill off characters like Burns and Flanders but will recast with the finest voice-over talent available." Dan Castellaneta (Homer), Julie Kavner (Marge), Nancy Cartwright (Bart), Yeardley Smith (Lisa) and Hank Azaria (Moe, Apu, others) had earlier signed two-year contract extensions, and Fox also gave the show a new two-season order, which will bring the run to 28 seasons. The loss of Shearer, if it holds, would represent the first major cast departure in over a quarter-century at "The Simpsons," and presents a major creative challenge for the series. In past cast battles, Fox has darkly warned that the voices are replaceable. The loss of Shearer, 71, also would represent the loss -- at least in terms of voice -- of some of the show's most indelible creations, ranging from a saintly hair-shirt neighbor (Flanders) to an evil corporate overlord (Burns). Like the rest of the cast, Shearer has also had plenty of extracurricular work, including his recent live-action "Nixon's the One." Shearer plays former President Richard Nixon in the show made for the British satellite network Sky and available stateside on YouTube. Entertainment Weekly, citing sources, reported that Shearer was holding out because of his schedule, and that the actor would not agree to record his dialogue "in a timely manner," unlike the other cast members.